I enjoy working in color as well as pen and ink. Many years ago I experimented with Crayola crayons, I did some ocean and lighthouse scenes, they turned out pretty well, if I can find them I'll post them here. I wanted to get back into using crayons, I have discovered coloring books for adults, more details and subject matters that appeal to the more mature as opposed to what is promoted to kids. 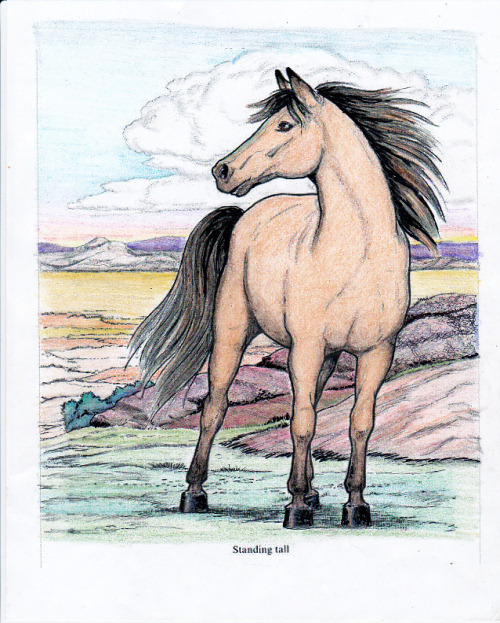 I downloaded this image of a horse and worked it with crayons. My technique is to lay down light (pressure) layers of color, after each layer I use an eraser to smooth out the color and remove some of the waxy buildup so that I can lay down more color on top. One thing that is difficult to do with crayons is get dark black, it ends up looking a pale gray, so I used a black Sharpie marker to put in some of the darks. Oh and I almost forgot, I wanted to add a highlight to the eye, and a tiny highlight in the nostril, I used some white nail polish, it worked like a charm! I did not draw this image, I only colored it, enjoy! Here is the one I started and completed today, I have been having such a good time with these, I am working on getting them neater looking, again I blame the lighting, uggghhhh, I have GOT to get some sort of light near my computer area, even in the day it's not well lit up here... ok, enough excuses, here is my next tangle. 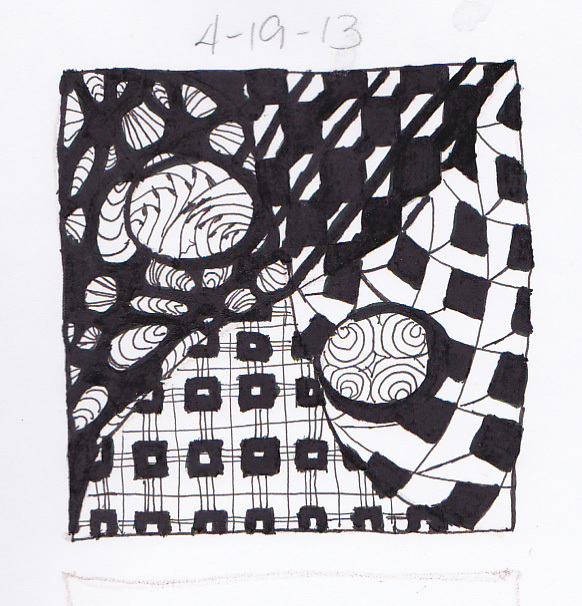 I used a pencil to sketch out the string, and used my pencil to draw in some temporary lines in the upper left corner design to get the squares and inner squares more precise, the pencil lines were then erased after I drew in the designs. A few days ago I spoke to our town librarian about this, she hadn't heard of Zentangles or anything like this, I did a quickie one on the spot to show her what they look like and how it works, she really liked it and could see the potential, we discussed possibly having a class at the library for the after school kids and even the adults, I am excited about doing it, will have to work on the structure of the class, how long it should last and what materials I will supply and what the kids will need to bring. I think this could be easily done with some printer paper, a pencil, and a thin Sharpie marker, we could also add some color with colored pencils, crayons and such. So if you are here reading this, first I want to welcome you here, and warn you, the look of this blog is liable to change, morph, grow, so if you come back and find a new look, rest assured you are at the right place. A little about myself, I'm knocking on 50, not there yet, but closer to 50 than I am to 40... I am a wife, mom, grandmother... I had an "interesting" life, in some cultures that is considered a curse, to me it is just who I am. I am an artist who loves music, or a musician who loves art? I think it's all entwined, the DNA in my body is full of art and music. I thank God for giving me these gifts, without Him all of this would be worthless, with Him all of this is priceless. I recently got back into drawing a few months ago after taking a 20 something year hiatus. I began feeling that "itch" that all artist understand, I've ignored that itch quite well over the years, not because I wanted to, but because I didn't feel like I had the time or space to devote to it. Now I have lots more time, even though I think I'm busier than ever, I'm living a different life, and there is room for art now! Where I live, I am surrounded by some very talented artists, that coupled with the great views where I live, I can't help but be inspired to take up this soothing yet invigorating craft. I enjoy working in color, I have worked in oils (didn't care for that), acrylic and watercolor, I have started playing around with Crayola crayons and have had some successes with that medium. 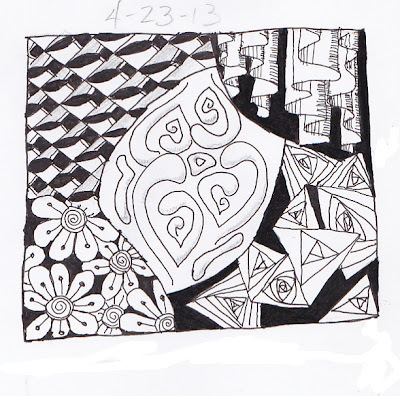 I am also playing around with something referred to as Zentangle or Zendoodle. 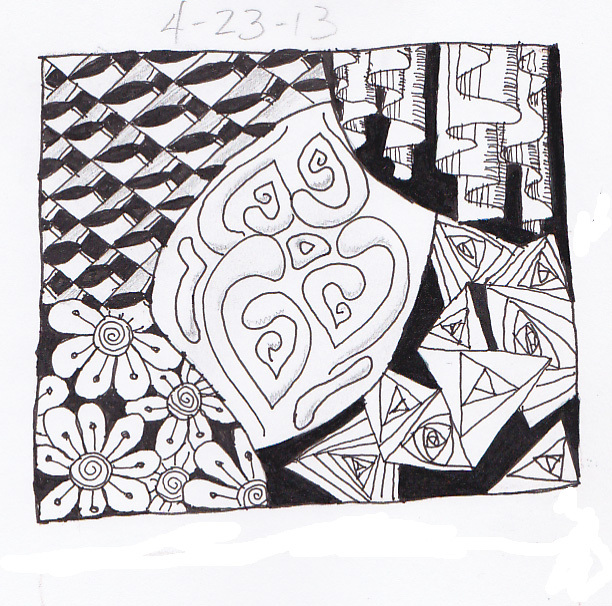 It's an advanced method of doodling, somewhat structured yet still doodling, I like it in B&W as well as color. 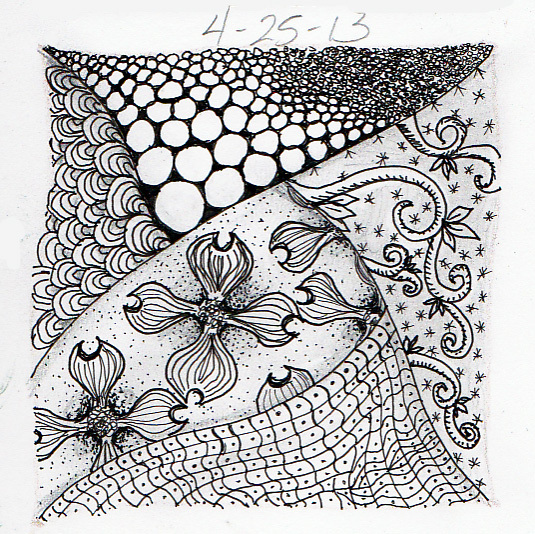 I have some decent pen liners to do some Zentangles now, it's amazing what good tools can do, I think I'll create the goal of doing one Zentangle or doodle a day and posting it, no guarantees though, I'll do my best and here is the first one. Yup, this is it, it's messy, it's imperfect, but it was fun! I'll have another one to post soon. Oh and in defense of the messiness of this one, I did it in semi-darkness, I don't have a good light near my computer area, during the day I have lots of light but if I work at night, which is when I often work, well lets just say it's not as easy to do more precise work in low lighting situations. I am also trying to decide if I want to do more freehand works (like this one) or try to use tools to make more precise lines, such as rulers, templates and such. I'm still learning and having fun, I also want to develop my own style.